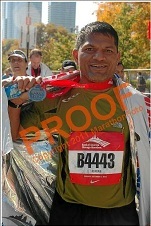 This was 37th Bank of America Chicago Marathon. For me it was 7th. This time the goal was to finish the race with no damages since didnt had much practice after the India visit in Jul-aug. Also due to over night officework I was doubtful of my participation. Some how managed to run the race on time. In-spite of waist pain manage to finish in 4:34. Overall good weather condition for running all the time (55 ot 60 degree F). Noticable event I see an an old man walking with two wooden support under his both armpits, some of the runners with just one leg, some are blind runners, one old lady may be in her 70's running her 27 Marathon accross world. Finally no need to say the winners ar eas usual Kenyans and Ethiopians. For me I was in wave two this time but liked the way they organized the race. It was perfect experience of organization and conditions. The Result. 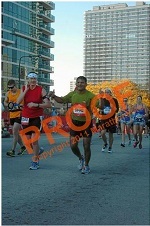 This was 36th Bank of America Chicago Marathon. For me it was 6th. This time the goal was to run for fun and finish strong a smuch I can. 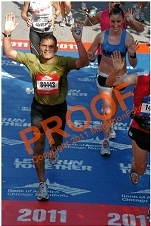 Inspite of joint pain on both the leg manage to finish in 4:27. I thought I should be able to complete in 4 hours thoguh. Overall good weather condition for running but later after 9am the temperatre went up to 63 degree F.
I was part of a historic day at the 35th anniversary Bank of America Chicago Marathon. In addition to a record number of finishers, Ethiopia’s Tsegaye Kebede set a new course record of 2:04:38, breaking the previous mark by nearly a minute, and Ethiopia’s Atsede Baysa’s one-second margin of victory over Rita Jeptoo of Kenya was the closest women’s finish in race history. It was cold morning but suitable weather for Marathoners (43F to 49F). This time no specific target to achieve since unable to spend sufficient training time. The primary goal was to complete the race and possible not too slow. I finished this 35th Bank Of America Marathon in 4 hrs 26 minutes. This time no black color nails since new pair of shoes (New Balance) did good job for supporting my kind of stepping and foot. Got one must stop feelings between 16-17 mileage and realized that I had same feeling (high heart rate) in the 16th Sept 20 Miler run. After time to time stretching 3-4 times during the run near aid station helped the cramp/locked joints release. Had one and half banana, 2 clifs gel, 1 fretzel stick (3 inch), 8 times 2-3 seeps of gatorade and water along 1 pee break total costing my 12 minutes of running time. This time the race divided into 2 waves. I was in the 1st group of Wave 2 (based on last results), started 30 minutes after the Wave 1 start time(7:30a). For me it was cold all the time in spite of wearing running tights and full sleeve running shirt. Sometime I kept my hands under the shirt close to belly. This time saw just one person failed down on side walk way due to some issue. Later learned that he had cardiac arrest but survived due to first aider. Also saw one lady runner with one real leg and other one metallic rod. Overall the crowd was same as enthusiastic as ever. Wonderful moment experienced during the run while watching some of spectators cheerfulness when their son/daughter/husbands/father/mother who all are on the run identified them. Also saw one of the moment where the runner was so engrossed with his headphone unable to hear the parents shout. Somewhere in the middle of the run one of the lady carrying/cheering the runners with a banner in her hand as "You have lot of stamina, call me", I really laughed for a moment since she shouted loud when I was passing by. I personally made sure to give Hi-Fi to kids who all are watching the race and stretching hand. At 14th mile 2 females may be 1st time Chicago Marathon participants were chatting and one of them asked when they will get Banana, after realizing her partner didn't know about, I replied " after 20 miles", I saw some freshness on their faces after hearing this. I was happy once when somebody among the lot identified me and it happened to me in my last Marathons somewhere around 19 miles. The women I don't know her name but Indian from Mumbai giving away banana's to runners. She was part of ASHA runners where I did mentored the UIC group of ASAHA runners in 2009 for just 3 sessions. I saw her when I picked up the banana and later realize the person who was distributing the Banana along with her was her husband. Around mile 20 a group of spectators were distributing beer (in small cup) to runners. It was fun to see some of the runners approaching but later leaving that option not to take. while some did took it and the person drank without spilt by reducing the pace, WOW...what a fun to watch all this. I remember my friend Kaivalya when I saw a person dress like Elvis P and singing in the middle of the road cheering all runners. This time I made sure to give him Hi-Fi like a stranger. I remembered my 10 months old daughter Vanita at critical time of the run that is after 22nd Mile. 20 to 26 is one of the hardest time for most of the runners (not elite runners). I did sprint last 200 meters as usual way getting the feeling that I still have lot of energy to push myself. This thought never came to me from 16th mile to 26.1 mile though. When something doesn't go as per your way you feel sad, same way I didn't feel happy about my run. I didn't do better than last year timing (4:22). After this run, I confirmed that if you don't train the right way you will not see better result even though mentally how strong you are and ran number of marathons in the early year. But I was ready for this hence didn't feel that bad. On a positive note I still feel that I can run 50 miler with slower pace this year. Also happy that I still have chance to do better. 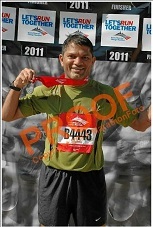 If not 50 Miler I might run another half marathon this year to complete total 100 miles of race distance for 2012. Let's see. Otherwise I enjoyed the race very much. Thanks to all my well wishers and friends whose indirect motivational support from social media sites. "The run was dedicated to Bhramanti and it's members specially during the last wall (6 miles) where nothing is comfortable”. The total finishers were 35670 (20256 males and 15414 females) out of 45000 registered runners from 25 countries. Congratulations to the 33,687 runners (19,069 men and 14,618 women) who crossed the finish line of the 2009 Bank of America Chicago Marathon, contributing to the largest finisher total in the 32-year history of the event. More importantly, each of you set out upon a journey to reach the finish line and achieved your goal. The Bank of America Chicago Marathon staff, the event sponsors, the City of Chicago, and the running community at large commend you for your impressive accomplishment. Kenya’s Sammy Wanjiru, the reigning Olympic Gold Medallist and London Marathon champion, laid claim to another piece of history by breaking the North American and course record with his exciting victory at the 2009 Bank of America Chicago Marathon. The 22-year-old sensation pulled away from his final challengers, Vincent Kipruto and Charles Munyeki, both of Kenya, just past the 35-kilometer mark. With a final surge down Columbus Drive, Wanjiru had just enough time to wave to the crowd before breaking the finish line tape in 2:05:41, eclipsing the previous North American and course record held by Khalid Khannouchi (MAR/USA) by a single second. The women’s race was a more tactical affair with all the pre-race favorites bunching together and laying watch on one another for the first 13.1 miles. With the lead pack whittled down to four women at 40 kilometers, Russia’s Liliya Shobukhova, in just her second marathon, took command and blistered the final 2.2k at sub-five minute pace to capture the title over runner-up Irina Mikitenko of Germany and defending champion Lidiya Grigoryeva of Russia. 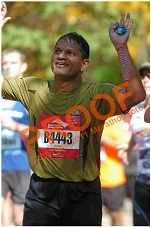 This time my intention was to qualify for the Boston Marathon. For my age group (35-39) it was 3 hr 15 min. I practiced for 4 months. Fortunately or Unfortunately I had 3 weeks of gap due to home country visit for official Visa formalities which turned into my marriage with Tanuja. I was hoping the timing is achievable though my practiced estimated time was 3 hrs 30min. It was cold for 1st 5 miles for me and unfortunately I could not able to get into the carol A where the 3-3:30 timers were supposed to stand in the beginning. I could able to manage to get into carol D which is almost minutes away from the start gun time(7:30am). On top of that my Garmin watch suffered due to cloudy weather for 1st 5 mile. I have to wait till permanent marker to restart the watch to keep me updated for my current pace. I finished in 3 hrs 35 min without any damages with 1 pea break and 2 major break of 2 min each for refueling myself with water gatorade and stretching Due to cold I felt some pull to my left thai and the break was necessary on the cost of loosing those valuable minutes. As usual the last 2-3 miles are painful and it was hurting since I left the hope since by that time I was fully aware of not completing the timing for Boston qualification. It was just the motivated run which I had planned this time for my club Bhramanti and my nephew Aditya whose Birthday is on 12th Oct.
*** My Best timings on 11th Oct 2009 26.2Miles in 3.35 in Chicago Marathon 2009. 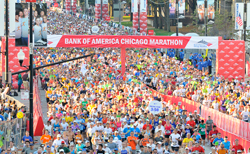 The Bank of America Chicago Marathon is the pinnacle of achievement for elite athletes and everyday runners alike. On Sunday, October 12, 2008 runners from all 50 states and more than 100 countries will set out to accomplish a personal dream. 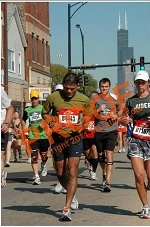 This was 31st Chicago Marathon. Total registered Participants 45000. Total finishers 31402. For me it was my 2nd Marathon. The last year was kind of eye opening experience. I didn't registered on time, since I wasn't sure about practice(training). Got the ticket from e-bay but then less time for training. On top of that, it was one of the hottest(90F) day of Chicago. 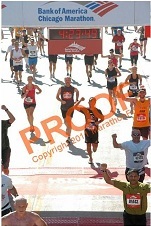 So my timing was not up to the mark, since I was aware of my capacity to run and expected to finish in 4 hrs. This time everything went as planned and hence the result. I did training for 5 months with maximum 50 miles a week. This time the weather was 80F overall and at around 21 Miles it went up to 83-85F. As usual during the wall (last 6 miles) it's more mental workout. Suddenly I felt like, I am not able to keep the pace, hence I reduced my pace for a while and then the last mile I ran with some recovery sprint run. It was one of the satisfactory moment. I felt like my training was worth, having reduced the timings from 5 hr 23 min(Last year) to 3 hr 49 min. After crossing the finish line got my medal and the body rapper. I went to the resting place, started regular stretching and heard few word Boston qualified from a parent of one of the girl participants, who was sitting next to me. It was indirect motivation to me, off course for the run and nothing else. But due to my overall performance, now I am feeling like I should keep running to improve my timings to 3:15pm(Boston Marathon qualification). I dedicate this run to my nephew Aditya who is celebrating his Birthday on 12th Oct. Happy Birth Day Aditya. - Videos can be viewed on youtube. Just searched for Chicago Marathon 2008.